After a month hiatus, I'm back for What We're Reading Wednesday! 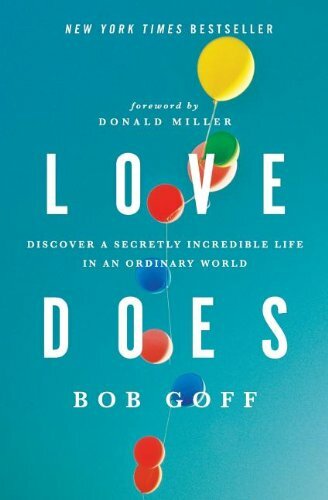 As I mentioned in my last quick takes post, right before the holidays I read two amazing books: Love Does by Bob Goff and Three Little Words by Ashley Rhodes-Courter. I was hoping to write amazingly detailed reviews of each of these, which would persuade you instantly to read them, but alas, the holidays have zapped my energy for such things and I had to return the books to the library. (Plus, if you've been here before you know that even when my brain is sharp, I do not write detailed posts! Ha!) But I will give you a brief insight into each of these. First, Love Does. Each chapter in this book tells a short story from the author's life that illustrates some aspect of love. And as the title implies, the type of love he is talking about is the type that shows itself through action. The stories from his life are nearly unbelievable, and yet he convinces you that they are attainable simply by not placing limits on love and God. One of his points is that God can best use us when we have an idea rather than a plan. We likely cannot dream anywhere as big as God can, and thus by having a specific plan, we achieve far less than if we just start running with an idea and trusting God along the way. This is an easy read, fun, humorous, and inspiring. Definitely a must read! Second, Three Little Words. This is an autobiography about a girl who was removed from her mother at age 4 and stayed in foster care until she was adopted as a teenager. The story of her life is so painful as she moves between foster and group homes. She is adopted as a teenager into a wonderful family and it takes many years for her to finally know and feel loved. Ashley does an excellent job of explaining the facts of her life and also her thought process throughout. After reading this, I can much better understand the emotional needs of foster children, and really any child who is not surrounded by a loving family. Of all my past WWRW books, this is my favorite. Read it. Two memoirs! Love Does sounds very inspiring! Three Little Words is your favorite, hmm? High praise! Might have to check these out. Thanks for sharing these! I always love checking out your reads because they so closely mirror what we're discerning as well.